As is the case for many indigenous peoples around the world, the preservation of culture and identity is important for the Sherpas. Language and scripts play an important role in this endeavor. The Sherpas are one of the main Himalayan indigenous ethnic groups, and their language is widely spoken in many isolated communities. Unfortunately, its use is diminishing rapidly due to the influences of outside society and culture. Luckily, many Sherpas of the present generation feel strongly that preservation of the language is important. Therefore, all of us must work hard to make this happen. This Sherpa-English dictionary, which has been compiled by expert linguist Professor Dr. Nicolas Tournadre, Lopon Gyurme Chodrak Sherpa, Dr. Lhakpa Norbu Sherpa, and doctoral student Mr. Guillaume Oisel, is an excellent model of the kind of high quality work that will help conserve the Sherpa language. I would like to thank all the co-authors for their dedication and contributions. The financial and logistic support of The Mountain Institute played a vital role in completion of this valuable work. I trust that this dictionary will play a positive role in conservation of the Sherpa language. The Sherpas are a minority ethnic group of Nepal. Their ancestors are believed to have migrated south from the Tibetan plateau over 500 years ago, and entered into the Khumbu, a vacant valley on the south slopes of Jomolangma (Mount Everest / Sagarmatha). The Khumbu was regarded as a beyul - one of Padmasambhava's sacred hidden valleys. The culture and language of the Sherpa people evolved in this isolated environment, and thus developed their own unique characteristics over the centuries. 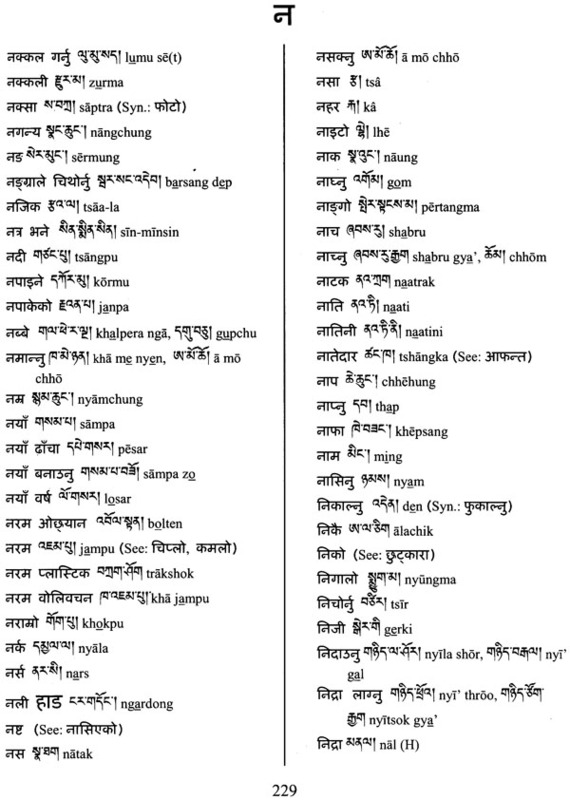 Sherpa is one of the Tibetic languages within the Tibeto-Burman group of the Sino- Tibetan family of languages. In recent years, the use of the Sherpa language has been declining rapidly. Because of unfavorable education policies and the increasing influence of dominant cultures, Sherpa is not being effectively passed on from one generation to the next, and it is not properly documented or taught in schools. If no action is taken, the Sherpa language could die out within several generations, thus threatening our identity and culture. As a member of the Sherpa community, I am very proud of our unique culture and traditions, and the prospect of losing this heritage has been worrying me. In the year 2000, I had an opportunity to express these concerns to the Tengpoche Rinpoche, Nawang Tenzin Zangpo. Rinpoche not only shared my concerns, but he himself had been thinking about compiling a glossary of Sherpa words for quite some time. Towards this goal, he had already collected a trunk full of documents. We agreed that the responsibility of preserving a language lies with the people who speak it. Therefore, we agreed that we must try to do something before it was too late. At that time, I was working on a multi-year Project in the Tibetan Autonomous Region (TAR, PRC) which made it difficult to start up language conservation in Khumbu. But in 2003, Rinpoche initiated the work of documenting the Sherpa language, with the assistance of Loppon Gyurme Chodrak, a native Sherpa who had graduated from a program in advanced Buddhist studies in India. By the time I returned from Tibet in 2005, over 10,000 Sherpa words had been collected and documented - with expanded definitions and explanations - to produce the draft Sherpa'i tshig mdzod chen mo kun gsal me long ("The great Sherpa dictionary: a clear mirror"). This compilation also contains histories and biographies of religious sites and personalities of the Solukhumbu region. In 2005, at Rinpoche's request, I took over responsibility for completing the Sherpa dictionary project. The first priority was to assist with completion and publication of the Shar pa'i tshig mdzod chen mo kun gsal me long. The second priority was to make the work more accessible. While the Shar pa'i tshig mdzod chen mo kun gsal me long is an invaluable compilation and a great resource book, it is written entirely in the. Sambhota (Tibetan) script, and thus cannot be used by younger generations of Sherpa, who are educated only in Nepali and English. 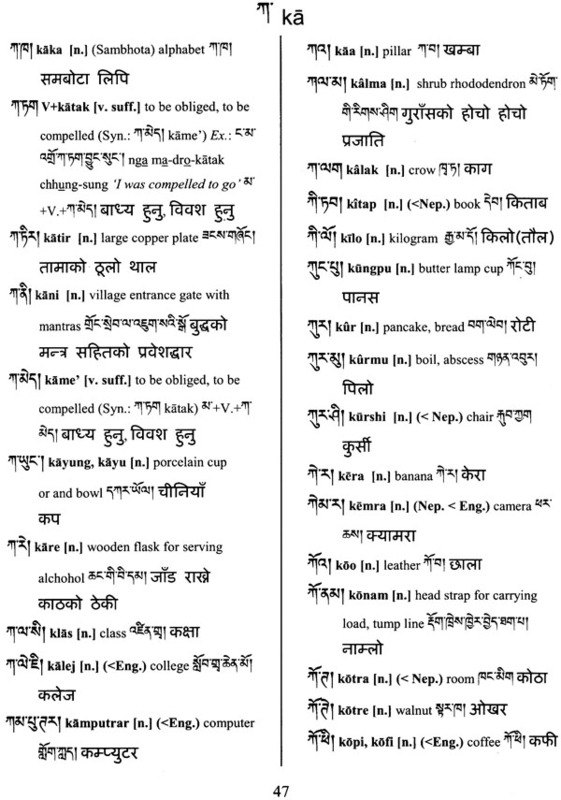 This led to the idea of developing a Sherpa lexicon with English, Nepali, and Tibetan translations, using Sambhota, Roman, and Devanagari scripts. The challenge was that simply knowing how to speak the three languages is not enough to develop a quality language dictionary. It requires input from many speakers, and from expert linguists. We were fortunate that we were able to call on the expertise of Dr. Nicolas Tournadre, Professor of Linguistics at University of Provence, France who specializes in Tibetan languages. Dr. Tournadre not only agreed to collaborate on the dictionary, but also involved his doctoral student, Mr. Guillaume Oisel. They took an active role in developing the Sherpa orthography and romanization system, in analyzing Sherpa phonology, and in providing Tibetan translations. Mr. Oisel took on the initial bibliographic research, computer entry, formatting, and layout of the dictionary. Most importantly, they contributed the academic rigor and linguistic expertise necessary to produce a quality work. 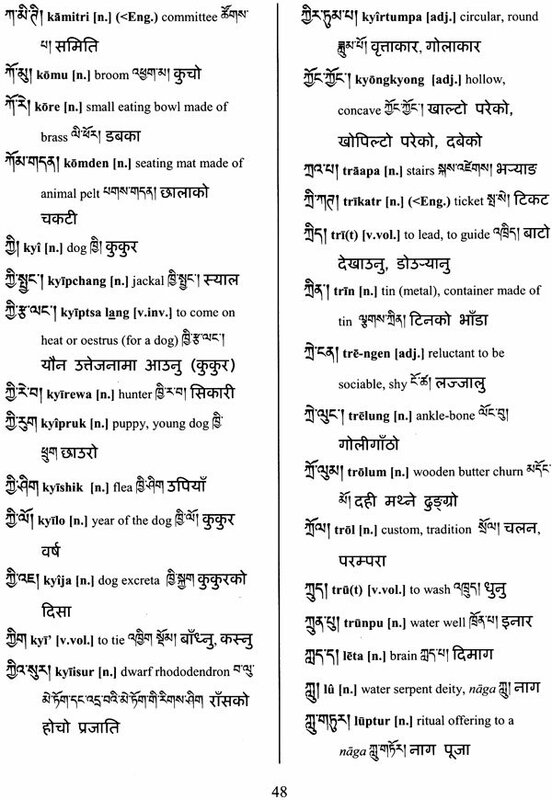 Mr. Gyurme Chodrak, for his part, contributed to the writing of Sherpa words using the Sambhota script. 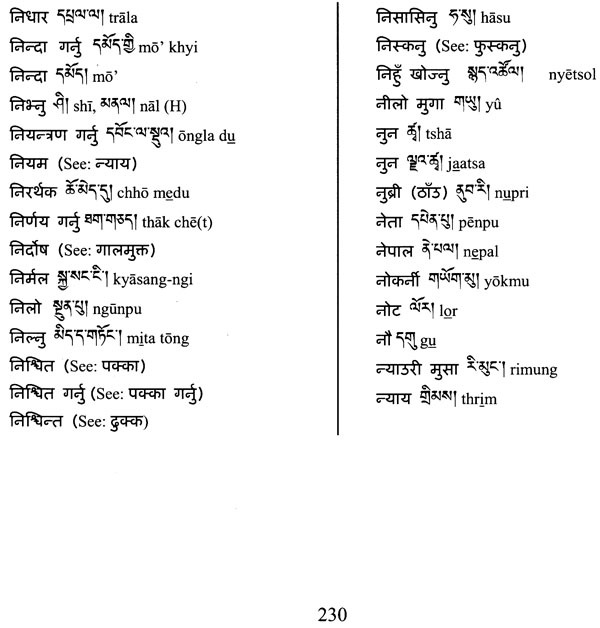 Many of the Sherpa words in this dictionary were borrowed from the Shar pa'i tshig mdzod chen mo - though it must be noted that, in order to represent authentic spoken Sherpa, we had to modify many words before integrating them into the dictionary, as they reflected the influence of Literary Tibetan. My own contribution was not that of an expert, but rather, a jack-of-all-trades. I assisted with ensuring overall consistency in translations between languages (Sherpa, Tibetan, English, and Nepali), and provided information on the Sherpa words and their pronunciation. I also raised some funds to support the operating costs of the project and served in the role of Director for the Project. This dictionary thus represents a great collaborative effort, and is the result of nearly four years of hard work (2005 to 2009). My wife Helen Sherpa and our children kept asking when the project would be completed. My 13 year old daughter, Pasang Yangjin, once said "it seems odd that my father is making a Sherpa dictionary but I know so little of it". This dictionary has been prepared both to help preserve the language and to help younger generations of Sherpas become more familiar with their ancestral language. Documentation of a language has no use unless there are people to use it. I hope many interested young Sherpas will find this helpful to reconnect with their community and culture. Although there are some dialectal differences, there is generally good intelligibility throughout the whole Sherpa linguistic area. Some would argue that the differences are significant between Solu and Khumbu. In any language, similarities and differences can be found. If the aim is to take into account all the dialectal variations, then designing a dictionary can become overwhelming. Therefore, it must be stated here that this dictionary is based mainly on the Khumbu dialect. I hope that this work will provide a basis for Sherpas from different regions to judge for themselves the similarities and differences. As we learn more about the language, we hope to offer information about other dialects and varieties. The Sherpas are a people of Tibetan origin and cultural affinities. They migrated from eastern Tibet in several different waves in the 16th through is" centuries, and settled in the present Solukhumbu area of Nepal, south of the Himalayas, near Mt. Jomolangma (Mount Everest). The Solukhumbu District lies within the Sagarmatha Zone, one of Nepal's fourteen administrative zones. The District itself consists of 34 Village Development Committees (VDCs). Three of the world's SOOO-meter peaks - Cho Oyu, Lhotse, and Jomolangma - are located within the Khumbu, the higher region of Sherpa country. This highland is drained by the Dudh Kosi and its tributaries: the Bhote Kosi, the Imja Khola, and the Solu Khola. The Khumbu area is part of Sagarmatha (Mt. Everest) National Park, a UNESCO World Heritage area. It is one of the main mountain tourist destinations of Nepal. The area is accessible by road from Kathmandu as far as Jiri, and then from Jiri on foot. It is also accessible by airplane, via the two small airports at Phaplu and Lukla. To the east of the Dudh Kosi river valley lies the Arun river valley, whose upper slopes are populated by Sherpa people. Sherpas are also found in three other regions adjacent to the Khumbu: Shorong (Solu), Pharak, and Rolwaling. Sherpa settlements are generally found at elevations between 2000 and 4500 meters above sea level. The four main Sherpa villages of Khumbu are Nauche (Nep: Namche Bazaar), Khumjung- Khunde, and Thame. The others are Tengpoche (Nep: Thyangpoche), Pangpoche, Dingpoche, Pheriche, Lopuche, Gorakshep, Phortse, Gokyo, Dole, Luza, Macharma, Khumjung, Khumde (alt: Khunde), Thamo, Thame, and Yilajung (alt: Yulajung). The Sherpa villages of Pharak are Thumbuk, Monzo, Phemkaro, Phakdingma, Chhutrawa, Yulnying, Kusum Tsangka, Nacho Pomdo, Lomzo, Kyongmo, Buwa, Tate, Seogma, Rimejung, Tshermadingma, Lukla, and Dungde. In the Shorung (Solu) region there are many more Sherpa settlements, and Salleri is particularly populous because of its status as District administrative center. The other Sherpa settlements in this region are Katidrangka (Nep: Kharikola), Manidingma (Nep: Nunthala), Trakshingtok, Ringmo, Salung, Jung (Nep: Junbesi), Thraktobuk, Changma (Nep: Bhandar), Thodung, Phaplu, Patale, Kyilkording, Gyapzuwa, Gholila, Setra, Sakar, Jalsa, Pang Khongma, Tsatuk, Kyama, Nyimare, and Mopung. A substantial number of Sherpa speakers are also found in Sankhuwasabha and Taplejung districts to the east of Solukhurnbu, and in Dolakha, SindupaIchok, and Ramechaap districts to the west of Solukhumbu. There are also some Sherpa speakers in Rasuwa district, which is otherwise predominantly populated by Tamangs. Today the capital city of Kathmandu has become a meeting place for Sherpa speakers from different mountain regions. In Tibet (the TAR, or Tibetan Autonomous Region), a small population of Sherpa speakers is found in the Dram area. Based on a 2001 census, the Central Bureau of Statistics (CBS) of Nepal reported that there were 154,622 Sherpas in Nepal, 19,706 of them living in the Solukhumbu area. An accurate figure for the total number of Sherpa speakers is difficult to determine. According to Graves (2007: 16), estimates typically range between 15,000 and 70,000. Bradley (1997) estimated the number of speakers as 50,000. There are several reasons for the discrepancy between estimates of Sherpa population size and estimates of Sherpa speakers. Some young Sherpas living in Kathmandu or elsewhere outside of the Solukhumbu area no longer speak the language. Also, members of other ethnic groups with which the Sherpa are in close contact may identify themselves as Sherpas, though they do not speak the language. Sherpa culture developed and evolved in a high-altitude environment. The Sherpas have traditionally cultivated potatoes, buckwheat, and corn, and herded yaks, cows, and yak-cow hybrids called zomo and zo. These agro-pastoral activities are supplemented by trade. In recent decades, the Sherpas have become increasingly involved in running tourism businesses such as travel logistics, lodge operation, climbing, and guiding. Sherpas have also gained international recognition for their mountaineering skills, and some of them have become quite famous. The Sherpas practice Vajrayana Buddhism and are followers of the Nyingma school. They are proud of their rich tradition, which they would like to preserve and develop. Since they settled in the southern Himalayas, the Sherpas have been in contact with other indigenous groups in the area-such as the Magar, Rai, Gurung, Sunwar, Jirel, and Hindu hill castes.